Although early-stage and locally-advanced gastric cancer (GC) can be treated by surgery, the truth is that many patients have to face local recurrence or distant metastasis even after gastrectomy . Besides that, approximately a quarter of patients have inoperable disease at diagnosis . Thus, GC is one of the most common cases where multimodality therapy (MDT) is often applied. It is widely accepted that chemotherapy is an indispensable part of MDT, since both palliative chemotherapy for advanced disease and perioperative chemotherapy have been proved to improve survival and quality of life in patients with GC  and 5-fluorouracil (5-Fu) based regimens are most generally used in this area. A growing body of evidence suggests that inter-individual variation in drug-metabolizing enzymes may affect anticancer drug efficacy by influencing related enzyme activities. Methylenetetrahydrofolate Reductase (MTHFR) which has been found to be associated with 5-Fu metabolism recently is the key enzyme in metabolism of folic acid-homocysteine which catalyzes the conversion of 5,10-methylenetetrahydrofolate to 5-methylenetetrahydrofolate. [9,10] Human's gene which expresses MTHFR locates on chromosome 1p, and several single nucleotide polymorphism (SNP) loci that associate with enzyme activity exist on that gene. Among those SNP loci, polymorphisms in MTHFR C677T (rs1801133) is most widely investigated . Although a series of studies have been performed to examine the association of MTHFR polymorphism C677T with the clinical outcomes of GC patients treated with 5-Fu based chemotherapies, the results were inconsistent and inconclusive. 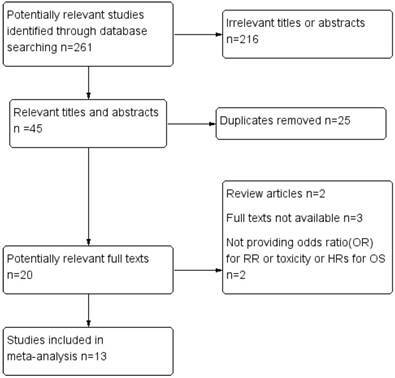 Therefore, we conducted a meta-analysis to evaluate the association of MTHFR polymorphism C677T with the prognosis and toxicity of GC patients treated with 5-Fu based chemotherapies. Studies focusing on MTHFR and gastric cancer were initially searched using PubMed, with the terms “Methylenetetrahydrofolate Reductase (NADPH2) / Methylenetetrahydrofolate Reductase (NADPH) / Methylene-THF Reductase (NADPH) / Methylenetetrahydrofolate Reductase / 5,10-Methylenetetrahydrofolate Reductase (NADPH) / Methylene Tetrahydrofolate Reductase / Tetrahydrofolate Reductase, Methylene / MTHFR” and “Stomach Neoplasms / Neoplasm, Stomach / Stomach Neoplasm / Neoplasms, Stomach / Gastric Neoplasms / Gastric Neoplasm / Neoplasm, Gastric / Neoplasms, Gastric / Cancer of Stomach / Stomach Cancers / Gastric Cancer / Cancer, Gastric / Cancers, Gastric / Gastric Cancers / Stomach Cancer / Cancer, Stomach / Cancers, Stomach / Cancer of the Stomach / Gastric Cancer, Familial Diffuse”. Another online search engine, Embase was searched with the terms “5,10 methylenetetrahydrofolate reductase (FADH2) / MTHFR / 5, 10 methylenetetrahydrofolate reductase (FADH2)” and “gastric cancer / stomach cancer”. Studies were included if they met the following criteria. First, objects of the study should have: (1) pathologically confirmed GC, (2) no concurrent uncontrolled medical illness, (3) treatment with 5-Fu-based chemotherapy, (4) measurable lesion if investigating response rate. Second, contents should illustrate clinical outcomes such as response rate, overall survival (OS) or toxicity involved with MTHFR polymorphism C677T. Meanwhile, Studies were excluded if they were: (1) in vitro studies; (2) not original research, such as review articles;(3) researches regarding MTHFR polymorphisms as risk factors for gastric cancer. Data from each included study was extracted using Microsoft Excel spreadsheets, including information on authors, publishing years, patients' clinical stage and ethnicities, ways of presenting results, evaluation criteria of lesion, sample size, chemotherapeutic regimens and outcome indicators such as odds ratio (OR) for response rate and toxicity, hazard ratio (HR) for OS. Additionally, we evaluated the quality of the included studies using the Newcastle- Ottawa scale based on three aspects: selection, comparability, and exposure, with scores ranging from zero to nine. Studies with a score equal to or higher than five points were recognized to be high-quality ones , whereas studies with scores less than five points were regarded as low-quality ones which would be further excluded. We analyzed the information which were discussed in included articles through Stata 12.0 (Stata Corporation, College Station, TX, USA). For SNP loci C677T, synthetic response rate, OS and toxicity were all calculable. Comparison of response rate and toxicity among patients with MTHFR polymorphism C677T were between genotype TT and CC+CT. Since some articles only presented data of CC and CT separately, we added the number of patients in these two groups up to form group CC+CT, then generated overall OR in meta-analysis through M-H model. Meanwhile, comparison of OS among patients with MTHFR polymorphism C677T took place between genotype CC and CT+TT, CC and TT, CC and CT or CT+CC and TT. Furthermore, we also combined the HRs together in articles which compared OS between genotype CC and TT, genotype CC and CT, separately, and then formed new result of comparison between genotype CC and CT+TT by synthesize the combined HRs and the already provided HRs together. All the HRs were combined through I-V model. Heterogeneity between included studies would be considered significant if I2>25%. If heterogeneities were not present, the synthetic results would be illustrated using fixed effects model, if not, randomized effects model were used and moreover, in order to explain them, sensitivity analysis like dropping out one included article or subgroup analysis would be performed. Subgroup analysis based on patients' ethnicities, chemotherapy purpose or ways of presenting results would be conducted for further interpreting initial results. Publication bias were statistically tested by the Egger's test. All P values were two-sided and all CIs had a two-sided probability coverage of 95%. Through applying the search strategy mentioned above, we found a total of two hundred and sixty-one studies in Pubmed and Embase. Two hundred and sixteen articles were removed due to irrelevant titles or abstracts, most of them were researches regarding MTHFR polymorphisms as risk factors for GC. After dropping out duplicates, twenty literatures were eligible for full text reviewing. Finally, seven case control studies and six cohort studies could be included in the meta-analysis [13-25], while the others were excluded because of following reasons: (1) review articles, (2) full texts not available, (3) neither providing ORs for response rate or toxicity nor providing HRs for OS. The process of study inclusion was listed in Figure 1. The sample size varied from 56 to 251 and the publication time was from 2004 to 2017. Most participants were Asian and European. The main characteristics of the thirteen included studies were listed in Table 2. All the eligible studies were of high quality owing to the fact that the NOS scores were higher than 5 points among the overall studies. Assessment of the quality of the eligible studies based on the NOS was listed in Table 1. 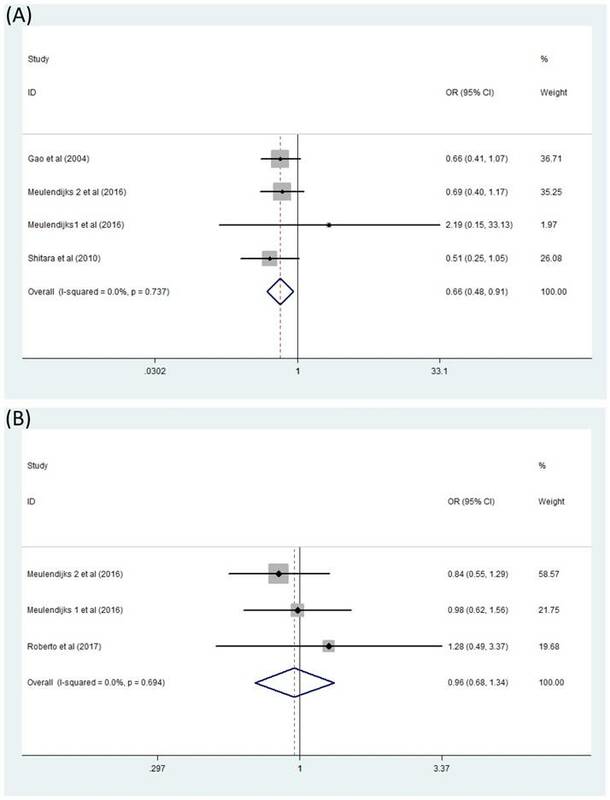 Comparison of OS between GC patients with genotype CT/TT and those with genotype CC when treated with 5-Fu based chemotherapy was exhibited directly in four articles [18-21]. Another three studies [16,20,22] presented results in a different way: OS of patients with genotype TT was compared with those with genotype CC and OS of patients with genotype CT was also compared against those with genotype CC. According to the statistical analysis procedure mentioned before, we processed these studies together to acquire a more comprehensive view of this question. The literatures included in this analysis contradicted, thus it almost seemed that OS of GC patients treated with 5-Fu based chemotherapy had nothing to do with MTHFR C677T polymorphism [(CT+TT)/CC HR=1.05, 95% CI: 0.86-1.26] (Figure 3A). This analysis was performed in a fixed effect model. Moreover, comparison between OS of GC patients with genotype CT+CC and OS of patients with genotype TT were also studied by some other researchers [15,23,24] but no relationship of significance could be found. [TT/(CT+CC) HR=1.48, 95% CI: 0.53-4.15] (Figure 3B). Assessment of the quality of the eligible studies based on NOS. 1Adequate definition of cases (0, 1); 2Consecutive or obviously representative series of cases (0, 1); 3Selection of controls: Community controls (0, 1); 4Definition of controls: No history of disease (0, 1); 5Study controls for the most important factor or any additional factor (0, 1, 2); 6Secure record (0, 1); 7Same method of ascertainment for cases and controls (0, 1); 8Same non-response rate for both groups (0, 1);9Truly or somewhat representative of the exposed cohort (0, 1); 10Selection of the non-exposed cohort (0, 1);11Demonstration that outcome of interest was not present at start of study (0, 1); 12Assessment of outcome (0, 1); 13Follow-up long enough for outcomes to occur (0, 1); 14Adequacy of follow up of cohorts (0, 1); 15Meulendijks 1 et al represents article published by this author in the journal Cancer; 16Meulendijks 2 et al represents article published by this author in the journal Pharmacogenomics. GC: gastric cancer; Others: evaluation criteria which were described in original papers; NR: not reporting; RR: response rate; OS: overall survival; Meulendijks 1 et al represents article published by this author in the journal Cancer; Meulendijks 2 et al represents article published by this author in the journal Pharmacogenomics. Forest plot of comparison: response rate of patients with MTHFR C677T polymorphism TT vs CC+CT. Meulendijks 2 et al represents article published by this author in the journal Pharmacogenomics. Difficulties occurred when we analyzed the association between MTHFR polymorphism C677T and toxicity of 5-Fu based chemotherapy because of very few reported literatures. Only two forest plots concerned about serious hematologic toxicity and serious global toxicity were finally generated. Here serious toxicity indicated adverse effects range from G3 to G4 and global toxicity were mainly composed of hematologic toxicity, gastrointestinal toxicity and hand-foot syndrome. 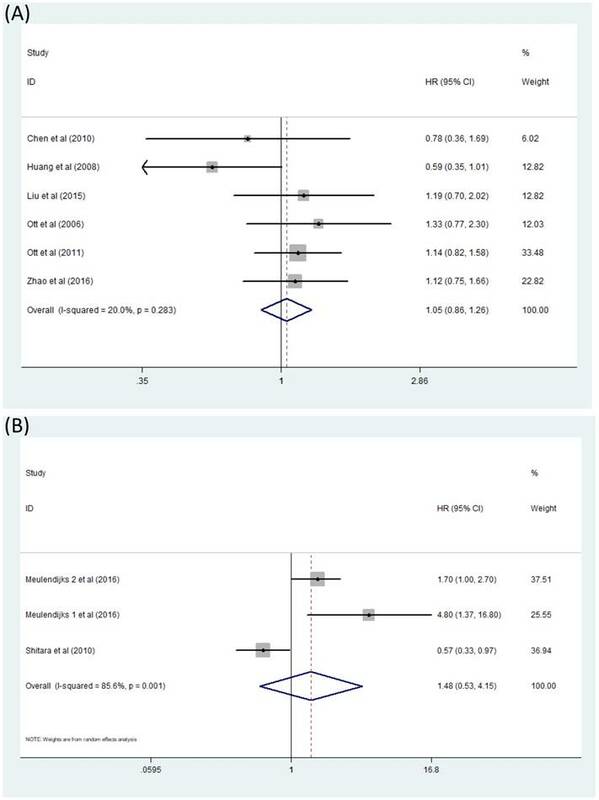 Combined analysis of four studies [13,15,23,24] containing data on serious hematologic toxicity were finished by fixed effects model (I2=0) and exhibited that significant difference appeared in the comparison between patients with genotype TT and patients with CC+CT [(CC+CT)/TT OR=0.66, 95% CI: 0.48-0.91]. (Figure 4A) However, this was not the same situation for serious global toxicity[15,23,25] which did not show any association with MTHFR polymorphism C677T through analyzing with fixed effects model(I2=0) [(CC+CT)/TT OR=0.96, 95% CI: 0.68-1.34] (Figure 4B). We performed sensitivity analysis by omitting one study at a time and recalculating the pooled OR and then figured out the source of the obvious heterogeneity in the combined analysis exploring the relationship of response rate and MTHFR C677T polymorphism in GC patients receiving 5-Fu based chemotherapy. The results of sensitivity analysis showed that heterogeneity came from Gao's study, but there was still no difference of significance between the response rate of patients in the two groups comparing with each other even after dropping out Gao's study  and applying fixed effects model [TT/(CC+CT) OR=0.87, 95% CI: 0.54-1.39]. Subgroup analyses were conducted for those studies that examine the association of OS with MTHFR C677T polymorphism in GC patients treated with 5-Fu based chemotherapy. We stratified the researches by the ways they presenting results first. In studies [18-21] directly comparing OS between GC patients with genotype CT+TT and those with genotype CC, only insignificant disadvantage of genotype CC over genotype CT+TT was discovered [(CT+TT)/CC HR=0.94, 95% CI: 0.73-1.22]. Other three studies [16,20,22] offered us results in another way: patients with genotype CC seem to own shorter OS than those with genotype TT. No significance existed as the HR of group TT versus CC was 0.85, 95% CI: [0.60, 1.20], and no significant results could be concluded when comparing OS of GC patients with genotype CT against genotype CC [CT/ CC HR=1.10, 95% CI: 0.77-1.57], either. Stratifying by patients' ethnicities, the pooled HRs of GC patients with genotype CT+TT versus those with genotype CC were 0.92 (95%CI: 0.66-1.28) for studies conducted in Asian [18-21] and 1.19 (95%CI: 0.90-1.58) in European [16,22]. With stratified analysis that was based on the chemotherapy purpose, the pooled HRs of genotype CT+TT against CC were 1.03 (95%CI: 0.76-1.38) in the subgroup 'perioperative' [16,20,21,22] and 1.04 (95%CI: 0.67-1.61) in subgroup 'palliative' [18,19]. The results of subgroup analyses are listed in Table 3. Forest plot of comparison: OS of patients with MTHFR C677T polymorphism. (A) CT+TT vs CC. (B) TT vs CT+CC. Meulendijks 1 et al represents article published by this author in the journal Cancer; Meulendijks 2 et al represents article published by this author in the journal Pharmacogenomics. No statistically significance of publication bias were detected by Egger's test in the combined analysis trying to figure out MTHFR C677T polymorphism's relationship with response rate [P=0.839] or OS [P=0.430] in GC patients receiving 5-Fu based chemotherapy. Forest plot of comparison: Toxicity of patients with MTHFR C677T polymorphism (CC+CT vs TT). (A) serious hematologic toxicity, (B) serious global toxicity. Meulendijks 1 et al represents article published by this author in the journal Cancer; Meulendijks 2 et al represents article published by this author in the journal Pharmacogenomics. Association between OS and MTHFR C677T polymorphism in GC patients treated with 5-Fu based chemotherapy stratified by ways of presenting results, patients' ethnicities or chemotherapy purpose. MTHFR is among those drug-metabolizing enzymes whose inter-individual variation may affect anticancer drug efficacy. Polymorphism MTHFR C677T is most widely investigated as they may lead to change in related enzyme activities, thus influencing 5-Fu metabolism. A series of researches have been conducted to explore the relation between this MTHFR polymorphism and the clinical outcomes of GC patients treated with 5-Fu based chemotherapies, but the results still remain controversial and uncertain. To our knowledge, though one meta-analysis with ambiguous conclusion on this question written by Wang et al  has already came out in 2012, quite a few new articles focusing on this issue have been published since that time and an updated systematic review may be needed to provide a more comprehensive view. Moreover, here we may also discuss what has not been investigated thoroughly due to limited resources in that article, MTHFR polymorphisms' relationship with the toxicity on GC patients who have received 5-Fu based chemotherapy, with more available data. 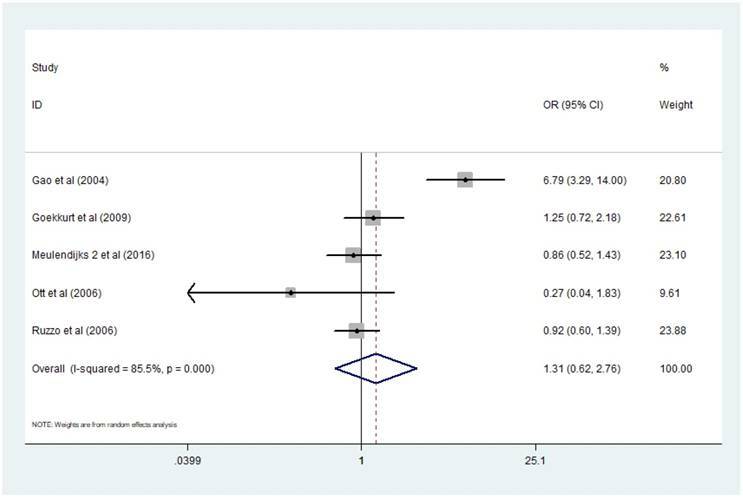 Well defined search strategy and strict inclusion and exclusion criteria increase the strength of this meta-analysis. In addition, we process these raw statistics as what is described in 'Methods' so that results of more universality can be generated. Performing subgroup analysis is another way to figuring out heterogeneity and promote the reliability of our review. However, some deficiencies still exist in our study. Firstly, near half of the included studies are retrospective, which may decrease our conclusion's ability to convince the causal relationship. Secondly, potential selection bias is introduced because of different studying objects inclusion criteria in included studies. For example, Roberto et al. include patients with early stage GC but Goekkurt et al  include patients with metastatic gastroesophageal adenocarcinoma. Thirdly, although all chemotherapies investigated here are 5-Fu based chemotherapies, the regimen in each single study is quite different from one another and this factor is not taken into consideration when performing meta-analysis. Fourthly, identifying all relevant literatures is impossible for us even with great efforts. Moreover, the number of included studies in each comparison is rather small which may decrease the significance of evaluation publication bias. Nowadays, the 5-Fu, either itself or other refined versions such as S-1, is considered as standard agent in GC chemotherapy, in combination with other agents like platinum or not. Theoretically, after uptake by cancer cells, 5-Fu metabolizes to fluorodeoxyuridine monophosphate (FdUMP), thus inhibits thymidylate synthase (TS) from catalyzing deoxyuridine monophosphate (dUMP) to deoxythymidine monophosphate (dTMP) and finally destroys the steady state of DNA metabolism in cancer cells. Here in this process, MTHFR also plays an important role as FdUMP exerts inhibition on TS through forming trimer with TS and 5,10-methylenetetrahydrofolate, which is the substrate of MTHFR. What can be deduced is that decreased MTHFR activity leads to more substrate accumulation and more trimers forming, therefore confers a more effective TS inhibition and increased 5-Fu efficacy. MTHFR C677T single-nucleotide polymorphism is found to be associated with reduced enzymatic activity and the mutant genotype TT may result in up to 70% reduction in MTHFR activity . However, increasing published reports during recent years does not change the conclusion made by Wang et al  in 2012 significantly or indicate increased 5-Fu efficacy with decreased MTHFR activity. Our meta-analysis reveals no correlation of significance between MTHFR C677T polymorphism and response rate of GC patients accepting 5-Fu based chemotherapy, no matter before [TT/ (CC+CT) OR=1.31, 95% CI: 0.62-2.72] or after [TT/ (CC+CT) OR=0.87, 95% CI: 0.54-1.39] the sensitivity analysis and it turns out that OS of GC patients treated with 5-Fu chemotherapy has nothing to do with MTHFR C677T polymorphism [(CT+TT)/CC HR=1.05, 95% CI: 0.86-1.26; TT/(CT+CC) HR=1.48, 95% CI: 0.53-4.15]. What's more, the subgroup analysis conducted among researches exploring OS's relation with MTHFR C677T polymorphism in GC patients receiving 5-Fu based chemotherapy reveals no differences of significance in subgroups when stratified by ways of presenting results, patients' ethnicities or chemotherapy purpose. Toxicity of certain chemotherapies is always a great concern in clinical situation, no matter for doctors or for patients. However, few researches investigating the relation between MTHFR C677T polymorphism and toxicity of 5-Fu based chemotherapy in GC patients are available in 2012 and Wang et al just find three studies [14,24,29] which are applicable for analyzing the association in between. Two of them find no results of significance[14,24]; Another one reports that the mutant genotype TT is associated with higher frequency of non-hematologic toxicity (nausea/vomiting). Five years later, however, we seem to discover an intriguing result through analyzing the slowly increasing researches of this aspect: GC patients with CC or CT genotype tend to experience less severe hematologic toxicity than those with TT genotype when treated with 5-Fu based chemotherapy[(CC+CT)/TT OR=0.66, 95% CI: 0.48-0.91]. Actually, it is a phenomenon which is in accord with the theoretically deduction discussed above to some extent. The mutant genotype TT may result in up to 70% reduction in MTHFR activity thus leads to a more effective TS inhibition and increased 5-Fu efficacy. Meanwhile, from another aspect, for cytotoxic agents like 5-Fu, increased efficacy probably means increased toxicity and this is just the case for the mutant genotype TT as it seems to indicate higher frequency of severe hematologic toxicity in GC patients treated with 5-Fu based chemotherapy. Moreover, a possible deduction can be made here: The high possibility of severe hematologic toxicity brought by 5-Fu based chemotherapy in GC patients with genotype TT probably forces these patients to reduce dose or stop primary plan and switch to other ones ahead of time, thus makes genotype TT's effect of increasing 5-Fu efficacy and influencing clinical outcomes not very obvious and this is just what we see from the ambiguous results when comparing response rate and OS among GC patients with different genotypes. When it comes to serious global toxicity, no significant disadvantages of genotype TT are shown over another two genotypes [(CC+CT)/TT OR=0.96, 95% CI: 0.68-1.34]. In addition to the chemotherapy purpose, patients' races and elevated toxicity in patients with certain genotypes, those unclear results in regard to the relation between MTHFR polymorphism and prognosis of GC patients treated with 5-Fu based chemotherapy may be ascribed to two other reasons such as: (1) Multiple genes like ERCC1,GSTs rather than a single gene play certain roles in the complicated mechanisms that determines the prognosis of GC patients treated with 5-Fu based chemotherapies and other involved genes are not taken into consideration in this meta-analysis. (2) Chemotherapy which usually combines several drugs rather than only one drug is delivered to patients, thus drug interaction may also change the effect of MTHFR polymorphism. In conclusion, we newly found that the MTHFR C677T polymorphism TT may indicated higher probability of severe hematologic toxicity in GC patients treated with 5-Fu based chemotherapy. Meanwhile, just like previous researches, no relations between MTHFR C677T polymorphism and the efficacy of 5-Fu based chemotherapy in GC patients were revealed in this meta-analysis. Thus, we probably should pay close attention to GC patients' genotyping results of MTHFR C677T before their chemotherapy starts and patient's blood routine if a GC patient with mutant genotype TT is going to receive 5-Fu based chemotherapy. However, these results should be treated with caution because of potential bias and confounding factors. As a consequence, more better-designed high relevant large clinical trials are an urgent need in the future. This research was supported by grants from Science and Technology Committee of Shanghai (No.15411961900).